Find Cheap Tassimo Pods and Compatible Discs Offers and Discount Codes from Aldi, Morrisons, Asda, Sainsbury's and more! From energizing espressos to indulgent cappuccinos, prepare individual drink at the touch of a button. 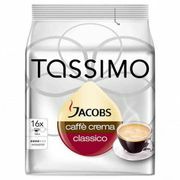 Are you looking for cheap Tassimo pods? Our massive community of bargain hunters are always on the lookout to find the best value for your money. 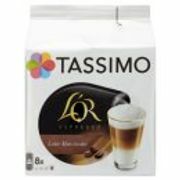 We have the latest Tassimo discount codes from your favourite retailers such as Asda, Morrisons, Tesco and Sainsbury’s. 48 Tassimo Costa Coffee Pods - Variety Pack Options! Tassimo was first introduced in 2004 in France and is now available to the rest of the world including the UK. All Tassimo machines have been developed in partnership with Bosch, so you can rest assured that reliability and build are second to none. The hot beverage system single-serve coffee system that prepares one-cup servings of espresso, regular coffee, tea, hot chocolate, and various other coffee drinks, notably those including milk such as latte or cappuccino. The system utilizes pods called T-Discs which are expertly designed to fit any Tassimo machine, so all you need to do is to pop one in and press the button. A bar code on top of each T-Disc instructs the machine to use the proper brewing settings. It will then change the water temperature, the amount of water, and the brew time and strength. This allows the Tassimo pod maker to brew a variety of hot drinks: filtered style coffee, cappuccino, short espresso, tea, and hot chocolate. The brewing process takes between 30–60 seconds. Discs containing milk use UHT milk, not powdered milk. These T-Discs are currently offered under brands owned by either Mondelēz or Kraft Foods such as Gevalia, Maxwell House, Mastro Lorenzo, Nabob, Carte Noire, Jacobs, Suchard and Twinings. Not all brands are available in all markets though. For example, Kenco T-Discs are available in the British Isles only, while Nabob T-Discs are only available in Canada. In some markets, Tassimo has entered into partnerships with third parties to market T-Discs from non-Kraft and non-Mondelēz brands. In the United Kingdom, T-Discs with the Costa Coffee brand have been sold since September 2012. 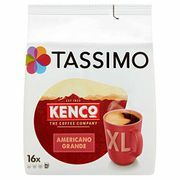 Here in the UK the larger supermarkets carry predominantly Kenco and Costa Coffee ranges in T-Disc form for the Tassimo coffee machines. However there is a far greater range of coffee (as well as other drinks!) on the Tassimo web site. Using intellibrew, the Tassimo single cup brewer is the only system that measures the right time, the right amount of water and the right temperature to make sure your drink is perfectly brewed each and every time. All you need to do to create your favourite hot drinks is simply pop a T DISC in your machine, press start, and voila! The INTELLIBREW system does all the work for you .Their beverage range includes coffee, cappuccinos and lattes, tea, chocolates, specialties and decaf. Costa: Founded in 1971 by the Costa brothers in London, it has become one of the country’s favourite coffee shop. Twinings: Twinings’ passion for perfection has inspired tea drinkers in Britain and across the world for more than 300 years. Kenco: You can now make the best out of each coffee with the country’s famous coffee brand. Cadbury: Today, Cadbury hot chocolate is fairtrade certified which ensures fair wages for our suppliers of cocoa. Milka: The tender taste of Milka. Jacobs: The delightful taste of Jacobs - one of the most loved coffee brands in Germany. L’Or: Founded in France in 1992, L'OR always had the ambition to offer the best coffee in the world. Grand'Mère: The generous taste of a traditional coffee. Where can I buy cheap Tassimo pods? Whether you call it T Discs or pods, here at Latest Deals we have the hottest Tassimo discount codes, offers, sales and deals shared by our massive community of bargain hunters. You will find great savings and deals on a fantastic range of Tassimo T Discs from coffee to cappuccino and latte like this 48 Tassimo Costa T-Discs Variety Pack from Wowcher which you can get for just £14 instead of £34.99. That’s a huge 69% off by using the Tassimo discount codes posted by our bargain hunters! Tassimo pods Sainsbury’s: The retailer offers Tassimo compatible pods which are created with the same authentic taste such as Costa, Kenco and Cadbury. They also have other flavours like Oreo for kids of all ages. Price range from £4 to £5 per unit or £1.67/100g to £3.13/100g. Tassimo pods Morrisons: From a creamy latte, a tasty cappuccino or uplifting Americano, Morrisons has a wide range of T Discs in 8s from £4 to £5. Tassimo pods Tesco: Compare and buy online Tassimo pods at Tesco and earn Clubcard points with your purchase. Tassimo pods offers Asda: The retailer currently offers select flavours at £3.99 or you can mix and match 3 Tassimo coffee pods for £10.00! A Tassimo machine can cost you around £80-£100 but you will often find special offers around half of its original price. The great thing about it is that all models uses the same range of Tassimo pods to make your favourite beverage so buying a cheaper model is okay as well if you’re on a tight budget. Make sure to keep an eye out on the latest offers our bargain hunters will post as they are on the lookout every month for the best possible deals out there. Tassimo My Way – Bosch: You can choose the temperature, volume and intensity of every single drink, that’s why they call it the personal one. Vivy 2 (T140): It features innovative flow heater technology means there is virtually no heat-up time with automatic cleaning and descaling programme. Easiest drink preparation fully automatic drink preparation with just one button. Very space saving Compact brewer dimensions. No heat up time after switch-on instantly ready to start your drink. Ideal for kitchens with limited room, it also has an 'auto-off' function, saving energy and time. Tassimo Caddy (T70) and Caddy Silver Edition (T75): Keeps the T DISCs for your early-morning coffee, midday tea or after-dinner espresso right where they belong – neatly stored and organized next to your machine. Delivered with two holders, each offering space for up to 16 capsules, you can add a maximum of eight to store up to 128 T DISCs in total. Tassimo Suny (T32): When you need your favourite drinks in a hurry, this machine delivers on time. Just pop in a T Disc, press with your cup against the Smart Start button, and watch it create your beverage. It comes in a sleek design and compact dimensions, available in Midnight Black, Autumn Red or Pacific blue. The Smart Start technology makes drinks as soon as you press your cup against the front of the machine. Tassimo Joy (T43): This machine is reliable, innovative and designed for ease of use – either in Clear White or Intenso Black. A mighty 1.4 litre removable water tank means you can make drinks for everyone, all in one go! A flexible on-board capsule storage on Caddy. Adjustable drinks as each Tassimo pod comes with a barcode that tells the machine how much water to use for that drink. Though the more expensive models will allow you to manually adjust your drink’s size. Pricier models also has a liquid crystal display which helps in personalizing your drink and tells you when it’s time to descale your machine or when it’s time to refill the tank. Large water tanks are also one of the features of the high-end models as well as comes with water filters that fits into its tank. If you’re not after some of these added features that the pricier models have, then you can simply pick a machine based on the space you have on your kitchen or wherever you plan on putting your Tassimo machine and of course how much you’re willing to shell out as well as which model will fit your home’s décor. Coffee is a unique product and black coffee is probably the purest version of it. Have you ever tried a black coffee without any ingredients? Leave out the cream and the sugar and you will discover the unique flavors of coffee and smell the indulgent aroma. Master Blender Roland Bouwer reveals his 3 main tips for the perfect cup of coffee. To learn more about it Click Here.